Addiction to alcohol or drugs is a chronic disease in which an individual indulges in compulsive addictive behaviors despite being aware of their harmful consequences. Over time, excessive alcohol intake or illicit substance use leads to long-lasting changes in the brain and body, further driving the addiction. Substance use disorders are relapsing in nature. In other words, there is always a risk of returning to alcohol or drug use after attempting to stop. Can alcoholism and drug addiction be treated? Treatment for addiction is possible but it is a complex process. It is not simply a matter of stopping use for a few days and becoming cured. Most people need a number of interventions and long-term sustained care to completely stop using and get their life back on track. There are a number of options for treating an addiction to illicit substances, such as medications, behavioral modification, individual and group therapies, skills training, treatment for coexisting mental health problems, and relapse prevention strategies. Read on to find out everything you need to know about drug and alcohol addiction treatment. Inpatient versus Outpatient: What Are the Most Effective Addiction Treatment Programs? Many alcohol and drug addiction treatment centers offer a range of recovery programs. So, how does one choose between inpatient and outpatient addiction treatment? Inpatient programs are widely recommended because they are effective, especially in people who have a severe drug or alcohol abuse problem. Outpatient programs produce results in individuals with a mild addiction. Outpatient treatment is suitable for people who cannot afford inpatient programs or individuals who do not have the luxury to take time off for intensive inpatient detox and therapy. It is important to remember that substance abuse recovery programs are not one-size-fits-all. Drug addiction treatment and alcohol recovery programs must be individually tailored to address the physical, emotional, social, and financial needs of an individual. One recovering addict may benefit from a certain program while another individual may need a completely different process to become drug-free. Everyone’s situation is unique. The reasons for beginning to use, the choice of illicit substance, the amount used, and the motivation for quitting are different for every person. Due to these varying circumstances, the treatment for each addict must be customized. Inpatient programs are recommended for people with a longstanding addiction or a history of heavy drug or alcohol use. These programs also benefit people with a dual diagnosis, for example, a substance use disorder combined with a mood disorder. Inpatient programs are more intensive and offer 24-hour monitoring. They aid recovery by providing a peaceful and controlled environment that does not leave room for relapse. Outpatient programs are usually suitable for people in the early stages of addiction or those who have been addicted for a very short period of time. Some recovering addicts have children to care for or other family responsibilities, which preclude the entry into an inpatient program, leaving outpatient addiction recovery as the best, or only, option. Is there an addiction treatment near me? This is a question many recovering alcoholics and addicts ask themselves. Treatment centers are available all over America and around the world. The choice to be made is between short-term programs for inpatient alcohol treatment or long-term programs for addiction, both of which have certain advantages and disadvantages. The journey to sobriety is neither easy nor short. Each recovering addict goes through an extremely personal journey to freedom from alcohol or drugs. Yet, there are 4 key stages of addiction treatment that are necessary for every individual with a substance use disorder. Acceptance of the problem – Finding the motivation to get clean. Detoxification – Removal of drugs and harmful substances from the body. Rehabilitation – Counseling sessions, intensive therapy, and overall health management. 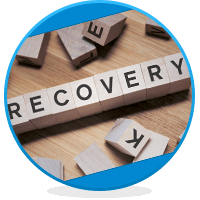 Recovery – Exit from the rehab facility with continued outpatient therapy. The ultimate goal of recovery from substance abuse is to stop using drugs or alcohol, stay clean or sober, and become a productive member of the family, workplace, and community. The underlying principle of addiction treatment is that no one treatment is right for everyone. Effective substance abuse recovery programs address all the addict’s needs, not simply the alcohol or drug use. Quick access to a drug recovery program is critical, as is sticking with treatment. Medications, counseling, and therapies are the cornerstones of most addiction treatments. What is a good drug addiction treatment program? Effective programs have the flexibility to be reviewed and modified to address the patient’s changing needs. Comprehensive drug addiction treatment centers offer therapies to address coexisting mental disorders. Addicts are at increased risk of hepatitis B and C, HIV/AIDS, and other infectious diseases, and good drug recovery programs offer testing for these conditions. It is important to remember that treatment for drug addiction or alcoholism may not always be voluntary but can still be effective. Addiction is called the disease of denial. Therefore, perhaps the most critical phase of treatment for drug addiction or alcoholism is accepting there is a problem and becoming motivated to do something about it. An intervention is a structured process that is undertaken to persuade someone with a drug or alcohol problem to seek help. Early contemplation of addiction treatment is followed by a determination and commitment to action. The endpoint of this stage of the recovery process is intake into a drug alcohol treatment center. What is detoxification? It is a part of the recovery process that involves checking into a rehabilitation facility and stopping the use of drugs or alcohol. 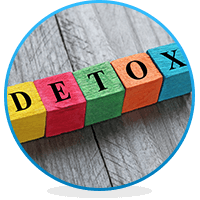 The purpose of detox is to clear the addict’s system of drugs and other harmful substances under medical supervision. This ensures that the chemical imbalance in the brain is corrected and the hold of the drug on the addict’s brain is relinquished. Detox can be a painful process because it is often associated with unpleasant withdrawal symptoms. The precise symptoms experienced by an addict depend on the substance used, the duration of abuse, and the individual’s unique body milieu. With proper medical care, most recovering addicts can come through detox and ride out the unpleasant, and sometimes serious, symptoms. For obvious reasons, people with substance use disorders should not attempt detox at home without proper medical supervision. Unsupervised detoxification can result in life-threatening, and sometimes even fatal, events. What is rehabilitation? Once the detox phase is over, the patient moves on to the rehabilitation phase of the drug abuse treatment. This is the part of the program where recovering addicts receive intensive therapy and one-on-one counseling. During the early stages of treatment, patients are usually not allowed contact with family and friends. Alcohol and drug addiction counselors work with the patient and help focus entirely on healing in a safe and stress-free environment. The purpose of these various therapies is to determine why a person started using drugs or alcohol in the first place and to enhance motivation to seek treatment. These therapies also help recovering addicts handle potential triggers which they will no doubt face once they return to routine life. Patients are taught coping mechanisms for stressful situations and strategies to avoid drug relapse. Many people start using drugs or alcohol in response to trauma or personal issues, such as self-esteem or mood disorders. In such cases, the recovering addict needs to learn to cope with these issues without turning to drugs or alcohol. The ultimate goal is to learn methods to stay sober in the long-term. It is not unusual for recovering addicts to experience the pink cloud syndrome, a high-on-life feeling in the early stages of recovery that can sometimes lead to unrealistic expectations. In patients with a dual diagnosis, both disorders must be treated concurrently for best results. For example, a mood disorder will often require additional therapy, usually in the form of cognitive-behavioral therapy to change the way a person perceives or responds to events. Medications can help keep symptoms at bay, at least until the person is stable enough to handle the emotions on their own. The addiction treatment process is not complete when the rehabilitation phase is over. The recovering addict still needs to navigate life after rehab. A support system is critical to maintaining sobriety. Family members, who are usually kept away during the early stages of addiction treatment, now play a vital role at the time of release from the rehab facility. Family counseling is offered to help recovering addicts make amends with those they may have hurt in the past while actively using drugs or alcohol. Friends and family members who care for the person help them in adjusting to life outside the treatment center and to stick with outpatient therapy as recommended. Different types of treatments for addiction are designed to give the recovering addict time to uncover and process feelings and issues that led them to addiction in the first place. During the recovery phase of the addiction treatment, patients have a chance for continued growth to work towards an alcohol- or drug-free life. Many people struggling with alcoholism or drug abuse feel a sense of isolation. Support groups are an integral part of the recovery process for people with substance use disorders. These groups allow recovering addicts to develop connections with others battling similar problems and to encourage one another, offer advice, and work on beating addiction together. This sense of purpose and belonging is critical in easing the loneliness many addicts face during the addiction recovery process. If you or someone you love is suffering from an addiction, help is just a phone call away. Call our free helpline (888)-459-5511 for more information on treatment for substance abusers. Advisors are available to answer your questions, give you more information on addiction treatment programs, and guide you towards reclaiming your life. Calls are always confidential and secure. This post was very informative about the addiction treatment process. One of my coworkers has struggled with chemical dependency and I wanted to guide him toward the appropriate treatment to help him on his road to recovery. You make a good point about how varying circumstances require unique treatment plans. Thanks again for this information, and I will be sure to research addiction recovery in order to help my favorite coworker! My sister is struggling with addiction and my family and I are looking into some treatments that would be good for her. I like how you mentioned about after rehabilitation comes recovery and that is when she will have to figure out how to navigate life without chemical dependency. I think counseling and support groups will definitely help with the recovery process. Thanks for the information! my brother studying in U.K is suffering from substance abuse. Please any help. started smoking marijuana at age 17. Hi, I am glad you are offering help to people. I am not sure I need help but I need help to find out. I may or may not be at risk with alcoholic drinks.